ItemD-09087 - Geological survey of Canada. ItemD-09094 - Geological survey of Canada. ItemD-09097 - "Somass River, Alberni, BC"; geological survey of Canada. ItemD-09099 - Geological survey of Canada. ItemD-09101 - "Della Glacier, Interior of Vancouver Island, BC"; geological survey of Canada. ItemD-09103 - Geological survey of Canada. ItemD-09111 - The SS St. Lawrence at Kyuquot. ItemD-09112 - The second cabin on the Yukon telegraph line; Skeena River district. Item D-09101 - "Della Glacier, Interior of Vancouver Island, BC"; geological survey of Canada. 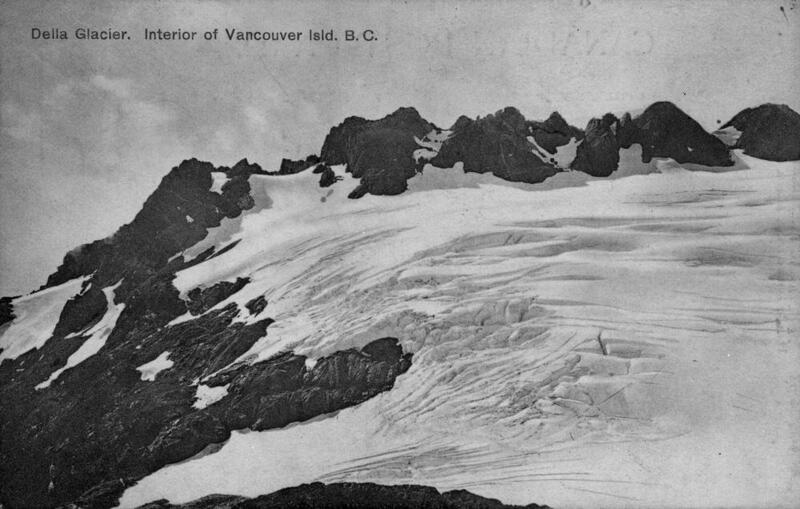 "Della Glacier, Interior of Vancouver Island, BC"; geological survey of Canada.